Sam Gravestock hits the deck with our folding sleep mat. So we all know insulation from the ground when out camping is vital don't we? It prevents our body heat from being drained away from us by the cold ground resulting in a cold unpleasant nights sleep and less than top performance the next day. 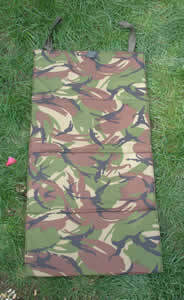 However whilst air beds, self inflating mats and the traditional closed cell foam (CCF) mats are all options, they have a competitor in the Folding Sleep Mat. The folding mat folds to a compact size (48 x 23 x 8cm) which is a smaller size than most closed cell mats. Another advantage over closed cell mats is that when unfolded the folding mat is completely flat unlike ccf mats which always have a slight curvature to them. When unfolded it has a total size of 185 x 48 x 1.3cm which is plenty big enough to act as insulation from the ground for the entire sleeping person on top of the mat. It is split into eight sections to allow easy folding thus also preventing wearing out specific parts of the material - a hazard always present with self-inflating mats and air beds. An added plus of this is that you can fold it into various sizes allowing it to be used as a sit mat or double thickness / half length. Another plus point of the folding sleep mat is that its outer fabric is PU coated 300D polyester making it rugged and tough against brambles and other sharp pointy things that can ruin expensive air beds or self inflating mats. So rugged in fact that it doesn't need a bivi bag to protect it when used on the floor. In fact I used it to protect my bivi bag when out camping rather than the other way around. I must admit that as it folds rather than being one rigid item I personally struggled to fit it into a bivi bag the first time i tried however this was purely pilot error rather than any fault of the mat itself. It works well as a barrier layer in a hammock preventing air flow against the body and as it is folding it moulds nicely to the body when in the hammock, not misshaping the hammock but allowing a warm and comfortable night. Another useful thing about this is that as it is lightweight it can be used as a second mat to increase insulation without significantly increasing pack weight allowing you to pack two sleeping mats if the mood strikes you to do so (something I regularly do in winter). 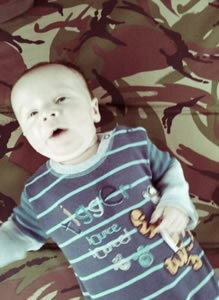 It also makes a fantastic change mat when taking kids into the woods as my son can testify! So there you go - an alternative to the known options for sleeping mats that has much potential with it. 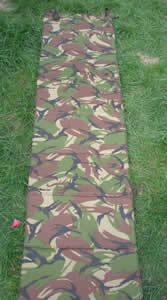 You can buy the Folding Sleep Mat directly from this site.